The Vision T9600 HRT Comfort treadmill is bigger and more stable than your ordinary Vision treadmills. It offers a larger, heavier gauge steel frame. It also comes with longer running surface, contact heart rate and a reversible deck. 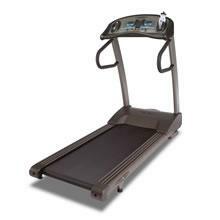 If you’re looking for a huge and stable treadmill that has excellent cushioning, then this is the machine for you. However, like most Vision models, this one is also made in Taiwan. And Taiwan built treadmills has a reputation for below average quality. So if you think this model is not for you, I suggest you visit our best buy treadmills page and look for the quality machine that fits you best. This treadmill boasts a 3.0HP continuous duty Cambridge motor that has a speed range of 0.5-12mph and an incline range of 0-15%. And with the new internal fan, you can be sure that this motor would be useful for very long. The 20” x 60” running surface is longer than your usual Vision. It provides more room for you to move and workout which is perfect for tall people who usually require longer strides. And, it still comes with 8 variable-durometer elastomers which cushion harmful impact on your knees, ankle and back for a safer, more injury-free run. The console is a SMART-MATRIX™ HRT® with 3 LED windows that shows you your speed, distance, time, calories, elevation, pace, heart rate, and avg. speed so you can always measure your progress. Plus, the 9 speed and elevation quick keys as well as the new contact heart rate give you more workout flexibility and variety. And finally, Vision T9600 HRT Comfort treadmill comes with a decent home warranty. It has a lifetime warranty for the frame and motor, 5 years for electronics and parts, and a year for labor. Just like other premium priced Visions, this models biggest weakness is its orthopedic or ortho belt. Ortho belts are softer than ordinary belts so it feels better to run on. However, the problem with it is that it causes more wear and tear on the treadmill which will eventually lead to tons of repairs and maintenance in the future. I would not recommend the Vision T9600 HRT Comfort treadmill unless you really have orthopedic problems. Besides, if you are in this price range you can already afford a Sportsart or a Pacemaster. Treadmills from these brands can give you way better value for your money than what this Vision model offers. If you plan on buying a Vision T9600 HRT Comfort treadmill, I suggest you buy it at vision. They offer the best price around the net. You can get it for just $2,199.